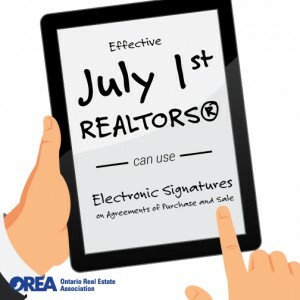 The Government of Ontario announced today that real estate consumers will be permitted to use electronic signatures on real estate agreements of purchase and sale (APS) as of July 1st, 2015. Electronic signatures on agreements of purchase and sale will significantly reduce the time required to process a deal. At present, agreements of purchase and sale are often faxed, scanned and emailed numerous times over the course of a transaction. The government’s decision comes in the form of proclamation of a 2013 amendment to the Electronic Commerce Act, 2000 (ECA), which extended the legal protections of the Act to include electronic real estate agreements of purchase and sale. The Ministry of the Attorney General is responsible for the ECA. The Ministry led the consultations and approved the final proclamation of the amendment.